The year has come to an end. In the past 12 months we’ve seen enormous interest in Estimote, iBeacon, and Bluetooth beacons in general. However, with all this excitement shared throughout media, business and developer communities alike, there also seems to be a bit of confusion about this technology. So we figured the best way to fix it is to delve deep into the underlying stack and explain what exactly beacons are and how they work. Enjoy the read! Das Jahr hat zu einem Ende kommen. In den letzten 12 Monaten haben wir enorme Interesse an Estimote, IBeacon und Bluetooth-Beacons allgemein gesehen. Doch mit all diese Aufregung im ganzen Medien, Wirtschaft und Entwickler-Communities freigegebenen gleichermaßen, so scheint es auch ein wenig Verwirrung über diese Technologie zu sein. Also dachten wir, die beste Weise zu befestigen ist, um tief in die zugrunde liegenden Stapel zu vertiefen und zu erklären, was genau Beacons sind und wie sie funktionieren. Viel Spaß beim Lesen! How does a beacon work? The principles are pretty easy. Under the silicone casing, there is small ARM computer, combined with a Bluetooth Smart connectivity module, powered by a battery. This little circuit board from Nordic Semiconductor is running Estimote firmware – the piece of low-level software installed on beacons, that makes sure they know exactly how to behave. While the computing power of the CPU and the amount of memory at its disposal are limited, it’s more than enough to handle tasks like processing sensor data or encrypting a beacon’s ID for improved security. Wie funktioniert ein Leuchtfeuer zu arbeiten? Die Grundsätze sind recht einfach. Unter der Plastikhülle besteht kleinen Arm Computer in Verbindung mit einer Bluetooth intelligente Netzwerkmodul, durch eine Batterie angetrieben. Das Stück von Low-Level-Software auf Baken installiert, die sicherstellen, dass sie genau wissen, wie sie sich verhalten macht – Diese kleine Platine von Nordic Semiconductor ist Estimote Firmware läuft. Während die Rechenleistung der CPU und der Menge an Speicher zur Verfügung begrenzt sind, ist es mehr als genug, um Aufgaben wie die Verarbeitung von Sensordaten oder Verschlüsseln eines Beacon-ID für eine verbesserte Sicherheit zu behandeln. On the thinner side of the beacon, there is a short wire sticking out of the CPU: the antenna. It’s broadcasting electromagnetic waves with specific length and frequency. Namely, 2.4 GHz radio waves. If you would open a beacon, you would notice that the antenna is nothing like the one your old TV set or radio set had. And not only because it’s so much smaller. It’s twisted and looks like a zigzag. There’s a reason for that. The electromagnetic field around a straight wire is shaped like a donut – the waves do not propagate in every direction with the same strength, leaving out sort of blank areas. Auf der dünneren Seite der Bake, gibt es einen kurzen Draht ragte aus dem CPU: die Antenne. Es sendet elektromagnetische Wellen mit bestimmter Länge und Frequenz. Nämlich 2,4-GHz-Funkwellen. Wenn Sie ein Leuchtfeuer zu öffnen, würden Sie feststellen, dass die Antenne ist nichts wie die alten TV-Gerät oder Funkgerät hatte. Und nicht nur, weil es so viel kleiner ist. Es ist verdreht und sieht aus wie ein Zick-Zack. Es gibt einen Grund dafür. Das elektromagnetische Feld um einen geraden Draht wird wie ein Donut geformt – die Wellen nicht in jeder Richtung mit der gleichen Stärke zu verbreiten, so dass sich eine Art leere Bereiche. The best solution to that is to reshape the antenna. The desired outcome is to achieve a perfectly spherical field. This, however, is not possible in real-world conditions, so there’s a lot of data science going into figuring out the right shape of that wire. There are tons of books available on antenna theory, and we’re also conducting our own lab tests to equip Estimote Beacons with an antenna providing the strongest and most reliable field. Die beste Lösung, um das an die Antenne umzugestalten. Das gewünschte Ergebnis ist eine perfekt kugelförmige Bereich zu erreichen. Dies ist jedoch nicht möglich ist, in realen Bedingungen, so gibt es eine Menge von Daten, die Wissenschaft gehen in herauszufinden, die richtige Form dieser Draht. Es gibt Unmengen von Bücher über Antenne Theorie zur Verfügung, und wir sind auch die Durchführung unserer eigenen Labortests, um Estimote Beacons mit einer Antenne die Bereitstellung der stärksten und zuverlässigsten Feld auszustatten. 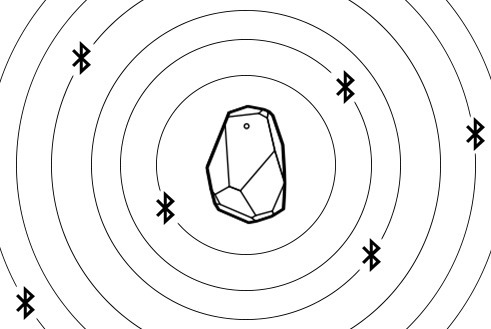 Beacons use Bluetooth Smart for communication. It’s the latest iteration of the Bluetooth standard, optimized for energy efficiency, meaning it allows for broadcasting only small amounts of data. The maximum payload of a Bluetooth 4.2 packet is 257 bytes. It’s not enough to embed media content and that’s why beacons only broadcast their ID’s (which in the case of the iBeacon protocol is divided into three values: UUID, Major, Minor) and information about signal power, essential for a nearby smartphone to calculate proximity. 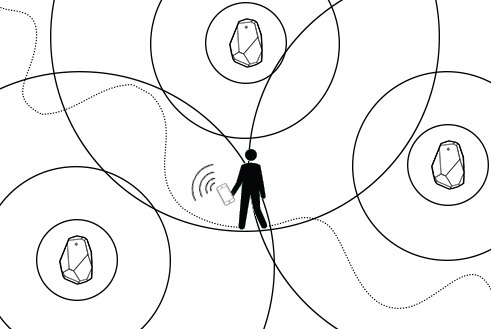 Beacons verwenden Bluetooth Smart-Kommunikation. Es ist die neueste Iteration der Bluetooth-Standard, für die Energieeffizienz optimiert, dh es können für die Übertragung nur kleine Datenmengen. Die maximale Nutzlast von einem Bluetooth-4.2-Paket beträgt 257 Byte. Es ist nicht genug, um Medieninhalte einbinden und deshalb Baken ihrer ID (was im Fall des IBeacon Protokoll ist in drei Werte unterteilt: UUID, Major, Minor) ausgestrahlt nur und Informationen über die Signalleistung, die für eine in der Nähe von Smartphone zu berechnen Nähe . The reach and stability of a beacon’s signal depends on two main factors: advertising interval (frequency) and broadcasting power. The beacon is not broadcasting continuously – it’sblinking instead. Advertising interval describes the amount of time between each blink. The more frequent the blinks, the more reliable the signal detection. That’s because smartphones also do not continuously scan for beacons. They do that with a given frequency as well, and to make it even more complex, this frequency may depend on the state the phone is in (locked or unlocked). The OS and device type also play a role. If the phone is active, scans will be happening very often, while if it lies locked in your pocket for a few minutes, it will start preserving its battery by limiting the number of Bluetooth scans. Die Reichweite und Stabilität eines Bakensignals hängt von zwei Hauptfaktoren: Werbe Intervall (Frequenz) und Sendeleistung. Die Bake nicht kontinuierlich Rundfunk – it’sblinking statt. Werbeintervall beschreibt die Zeitdauer zwischen jedem Lidschlag. Je häufiger die blinkt, desto zuverlässiger die Signalerkennung. Das ist, weil Smartphones auch nicht ununterbrochen Baken scannen. Sie tun das mit einer bestimmten Frequenz als auch, und, um es noch komplizierter zu machen, kann diese Frequenz über den Zustand sich das Telefon im (verriegelt oder entriegelt) abhängen. Das Betriebssystem und Gerätetyp spielen ebenfalls eine Rolle. Wenn das Telefon aktiviert ist, werden Scans werden sehr oft passiert, während, wenn sie liegt in der Tasche für ein paar Minuten gesperrt ist, wird es beginnen die Erhaltung seiner Batterie von Beschränkung der Zahl der Bluetooth-Scans. Estimote Beacons’ advertising interval is set to 950 ms by default, but that rate is adjustable. It can have any value between 100 and 2000 ms. The default rate was chosen for a specific reason. On average, iOS scans for beacons in 1 second intervals. 950 ms is almost the highest value to fit into this window. In noisy environments though, it might be possible that the advertising packet simply doesn’t make it to the device (e.g. somebody breaks the line of sight between the device and the beacon). Estimote Beacons „Werbung Intervall auf 950 ms voreingestellt, aber das Rate ist einstellbar. Es kann einen beliebigen Wert zwischen 100 und 2000 ms. Der Standardsatz wurde aus einem bestimmten Grund ausgewählt. Im Durchschnitt scannt iOS für Baken im Abstand von 1 Sekunde. 950 ms ist fast der höchste Wert, der in diesem Fenster zu passen. In lauten Umgebungen obwohl, könnte es möglich sein, dass der Werbepaket einfach nicht machen es auf das Gerät (zB jemand bricht die Sichtlinie zwischen dem Gerät und dem Beacon). One idea to improve detection stability is to simply increase the advertising frequency, by decreasing the advertising interval. If you set it to 490 ms, you should have two packets per iOS scan. 330 ms gives you three packets, 240 ms four packets and so on. What this means is that even if a single packet doesn’t make it to the device during the 1 second scan period, there’s a chance others will. You need to take into consideration that it will also impact beacon’s battery life, because more blinks equals greater power consumption. We’ve covered best practices for optimizing battery life elsewhere. Eine Idee, um den Nachweis Stabilität zu verbessern, ist, einfach erhöhen die Werbefrequenz, durch eine Verringerung der Werbeintervall. Wenn Sie es auf 490 ms eingestellt, sollten Sie haben zwei Pakete pro iOS-Scan. 330 ms gibt Ihnen drei Pakete, 240 ms vier Pakete und so weiter. Was dies bedeutet ist, dass selbst wenn ein einzelnes Paket nicht an das Gerät während der 1 Sekunden Scanzeit machen, gibt es eine Chance andere werden. Sie müssen berücksichtigen, dass es auch Auswirkungen auf die Batterielebensdauer Bake, weil mehr blinkt, ist gleich mehr Stromverbrauch. Wir haben Best Practices für die Optimierung der Batterielebensdauer an anderer Stelle abgedeckt. As important as advertising interval is the broadcasting power. It describes the signal’s strength and is measured in dBm – decibels referenced to milliwatts. A beacon’s range derives directly from the broadcasting power. If you want to see how signal strength translates to range, launch the Estimote app and connect to a beacon. The app can estimate range based on broadcasting power, but remember that it’s only an approximation. It’s not possible to measure exactly how far a radio wave propagate, because there is no specific point in space where it just stops. Consider a lightbulb: it makes a certain area bright, but the light itself travels much further, dissipated. It’s the same with beacons. Ebenso wichtig wie der Werbe Intervall ist die Sendeleistung. Es beschreibt die Stärke des Signals und wird in dBm gemessen – Dezibel Milliwatt verwiesen. Ein Leuchtfeuer der Bereich leitet sich direkt aus dem Sendeleistung. Wenn Sie sehen, wie Signalstärke übersetzt Bereich möchten, starten Sie die Estimote App und eine Verbindung zu einem Leuchtfeuer. Die App kann Bereich schätzen, basierend auf Sendeleistung, aber nicht vergessen, dass es nur eine Annäherung. Es ist nicht möglich zu messen, wie weit eine Radiowelle ausbreiten, weil es keine spezifischen Punkt im Raum, wo es einfach nicht mehr. Betrachten wir eine Glühbirne: es macht einen bestimmten Bereich hell, aber das Licht selbst reist viel weiter, abgeführt. Es ist das gleiche mit Baken. The closer you are to a beacon, the more accurate the distance estimates will be, because of higher signal density in the immediate vicinity of the source. As you move away, the signal gets more scattered and distorted, until it’s not possible at all to distinguish it from the background noise. To understand this concept better, imagine that the beacon is your radio set, and the broadcasting power is the volume setting. If you turn it up, you could hear it playing from far away, and as you’re getting closer, the sound becomes really crisp and clear. But if it’s really low, you might have problems with figuring out what track is playing even with your ear stuck to the speaker. Still, knowing the exact volume in decibels doesn’t mean you can determine exactly how far will the sound travel. There are too many factors affecting that, from the obstacles in the way, the physical matter through which the sound needs to propagate, to your hearing sensitivity. Je näher man an einer Bake, desto genauer sind die Abstandschätzungen werden, wegen der höheren Signaldichte in unmittelbarer Nähe der Lichtquelle. Wie Sie weg zu bewegen, bekommt das Signal mehr verstreute und verzerrt, bis es überhaupt nicht möglich, sie aus dem Hintergrundrauschen zu unterscheiden. Um dieses Konzept besser zu verstehen, sich vorstellen, dass das Leuchtfeuer ist Ihr Funkgerät, und die Sendeleistung ist die Lautstärkeeinstellung. Wenn Sie turn it up, können Sie es vom Spielen fern zu hören, und wie Sie näher sind, wird der Ton wirklich scharf und klar. Aber wenn es wirklich niedrig, könnten Sie Probleme mit, herauszufinden, was Spur wird auch bei dem Ohr an den Lautsprecher stecken spielen haben. Dennoch wissen die genaue Volumen in Dezibel bedeutet nicht, können Sie bestimmen, wie weit die Klang Reise. Es gibt zu viele Faktoren, dass, von den Schwierigkeiten in den Weg, die Materie, durch die der Klang braucht, um zu verbreiten, um Ihr Gehör zu Empfindlichkeit. You already know that a smartphone can approximate distance to the beacon after ‘hearing’ it. To do that, the phone reads a value called RSSI – received signal strength indicator. Then it examines Measured Power, delivered as part of the beacon data packet. Measured Power (depending on nomenclature, sometimes you may see it referred to as Tx Power) is average RSSI received at 1 meter distance, so by comparing it with the actual RSSI, a device can calculate its distance to a beacon. The 1 meter value used for calibrations wasn’t picked by an accident: as mentioned above, it’s easier to obtain accurate readings in close proximity, because of denser signal coverage. Sie wissen bereits, dass ein Smartphone können Entfernung zur Bake nach „Anhörung“ es anzunähern. Um das zu tun, liest das Telefon ein Wert genannt RSSI – Received Signal Strength Indicator. Dann untersucht er gemessene Leistung, als Teil des Beacon-Datenpaket geliefert. Gemessene Leistung (je nach Nomenklatur, manchmal können Sie sehen es als Sendeleistung bezeichnet) ist durchschnittlich RSSI bei 1 Meter Abstand erhalten, so dass durch den Vergleich mit dem tatsächlichen RSSI, ein Gerät kann seine Entfernung zu einer Bake zu berechnen. Die 1 Meter Wert für Kalibrierungen verwendet wurde, nicht durch einen Unfall aufgenommen: wie oben erwähnt, ist es einfacher, genaue Messwerte in der Nähe zu erhalten, wegen der dichteren Signalabdeckung. We’ve laid down the rules of calculating proximity, but as usual, practice is more complicated than theory. To understand it better, let’s go back to the radio set example, but imagine that instead of putting it in your living room, you’ve left it in the middle of a crowded train station. It’s playing on full volume, so you can easily hear that it’s nearby. Still, you can’t find its exact location, because people are constantly walking in and out of the station. Also, the trains coming and going, along with the speaker announcing arrivals and departures, are distorting the sound, so you’re never sure how far you are from your set. Calculating the exact proximity to a beacon based solely on the radio waves is exactly as hard. Instead of people passing by, trains leaving and the annoying, hardly-audible speaker, you encounter factors like multipath propagation, wave diffraction, absorption or interference. And remember when we said that it’s impossible to design an antenna with equal signal distribution in all directions? Because of that, the orientation of both beacon and smartphone can impact the approximation. Due to those factors, RSSI readings might fluctuate heavily, skewing the distance measurements. This is why if you place a beacon 10 meters away from your phone, it might report the distance of 8 meters, then make a correct assessment, then go up to 12 meters, down to 7, back to 10… you get how it works. And when you rotate the phone, it might think that you just moved 2 meters closer to the beacon. Wir haben die Regeln für die Berechnung der Nähe gelegt, aber wie üblich, ist die Praxis komplizierter als die Theorie. Um es besser zu verstehen, gehen wir zurück zum Funkgerät beispielsweise, aber vorstellen, dass, anstatt sie in Ihrem Wohnzimmer, können Sie es in der Mitte einer belebten Bahnhof verlassen haben. Es spielt auf volle Lautstärke, so dass Sie leicht zu hören, dass es in der Nähe. Dennoch, nicht aber seine exakte Position zu finden, denn die Menschen sind ständig zu Fuß in und aus dem Bahnhof. Auch die Züge kommen und gehen, zusammen mit dem Sprecher der Ankündigung Ankünfte und Abflüge werden den Klang zu verzerren, so dass Sie nie sicher, wie weit Sie von Ihrem Satzes sind. Die Berechnung der genauen Nähe zu einem Leuchtfeuer ausschließlich auf die Funkwellen auf der Basis ist genau so hart. Faktoren wie Mehrwegeausbreitung, Wellen Beugung, Absorption oder Interferenz anstelle von Passanten, Zügen, und die lästige, kaum hörbaren Lautsprecher, stoßen Sie. Und denken Sie daran, wenn wir sagen, dass es unmöglich ist, eine Antenne mit gleicher Signalverteilung in alle Richtungen zu entwerfen? Aus diesem Grund kann die Orientierung sowohl Bake und Smartphone die Annäherung auswirken. Aufgrund dieser Faktoren könnten RSSI Werte stark schwanken, Neigen die Distanzmessungen. Aus diesem Grund, wenn Sie ein Leuchtfeuer zu platzieren 10 Meter entfernt von Ihrem Handy, es könnte die Entfernung von 8 Metern, um 7 bis 10 zu melden, dann machen Sie eine richtige Einschätzung, dann gehen Sie bis zu 12 Metern, nach unten, zurück … erhalten Sie, wie es funktioniert . Und wenn Sie das Telefon drehen, könnte es denken, dass Sie gerade umgezogen 2 Meter näher an der Bake. 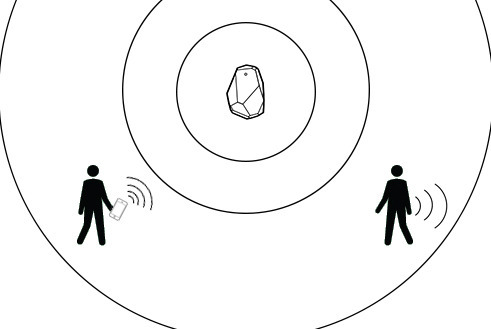 So, you might ask, if the RSSI is just a not-so-consistent estimation, is it then possible to build a reliable location service with Estimote Beacons (or any beacons, for that matter)? Short answer is: yes. Long one: this is exactly why hardware is only a part of great beacon solutions. Laws of nature put certain limitations on radio waves, so we need to utilize powerful software to make the most of what physics allows us. Both Estimote’s platform and Apple’s iBeacon standard take advantage of thousands of lines of code, written to overcome issues with shaky signal readings. In iOS, location services are governed by the Core Location framework, of which iBeacon is a part. Also, werden Sie fragen, wenn der RSSI ist nur eine nicht-so-konsistente Schätzung, ist es dann möglich, einen zuverlässigen Ort-Service mit Estimote Beacons zu bauen (oder jede Baken, für diese Angelegenheit)? Kurze Antwort ist: ja. Lang: das ist genau das, warum Hardware ist nur ein Teil des großen Leuchtturm-Lösungen. Naturgesetze stellen bestimmte Beschränkungen Radiowellen, also müssen wir leistungsfähige Software, um das Beste von dem, was die Physik erlaubt uns zu nutzen. Sowohl Plattform Estimote und Apples IBeacon Standard nutzen Tausende von Codezeilen, geschrieben, um Probleme mit wackligen Signalwerte zu überwinden. In iOS, sind standortbezogene Dienste von der Core Location Rahmen, von denen IBeacon ist ein Teil geregelt. 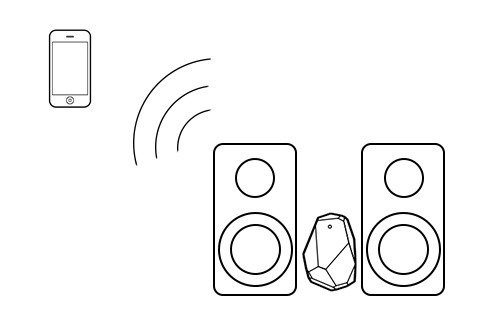 The Estimote SDK is built on top of Core Location, so it includes all noise reduction algorithms developed by Apple to smooth the signal readings. What’s more important, iBeacon wasn’t designed to operate on exact distance measurements in the first place – although you can still fetch them; read our SDK documentation for details. Instead, it uses proximity zones. There are four of those: immediate (very close to the beacon), near (about 1-3 meters from the beacon), far (further away or the signal is fluctuating too much to make a better estimate) and unknown. The framework was built in a way that allows for each zone entry to trigger different actions in the app. This gives you control over users’ experience in relation to their location and proximity to specific beacons. Die Estimote SDK ist auf der Oberseite des Kern Ort gebaut, so dass es alle Rauschunterdrückung Algorithmen von Apple entwickelt, um die Signalwerte zu glätten umfasst. Was ist wichtiger, wurde IBeacon nicht entworfen, um auf genaue Entfernungsmessungen in den ersten Platz zu betreiben – auch wenn Sie noch holen sie; Lesen Sie unser SDK-Dokumentation. Stattdessen verwendet es die Nähe Zonen. Es gibt vier davon: sofort (sehr nah an der Bake), in der Nähe (ca. 1-3 Meter von der Bake), weit (weiter weg oder das Signal zu stark schwankenden, um eine bessere Schätzung zu machen) und unbekannt. Der Rahmen in einer Weise, die für jede Zone Zugang zu verschiedenen Aktionen in der Anwendung auslösen können gebaut. Dies gibt Ihnen die Kontrolle über die Erfahrung der Nutzer in Bezug auf ihre Lage und die Nähe zu bestimmten Baken. But is it possible to receive more granular results? Say, down to few inches? After almost two years in the beacon market, we’ve heard those questions a thousand times. The answer again is yes, but before we go into the details, we should state something that’s crucial, but often forgot about. Nine times out of ten, you do not need anything beyond proximity zones to track location. If your app is about delivering deals relevant to an aisle in the mall, there’s no reason to pinpoint the user’s location with 50 centimeters accuracy, because the aisle is about 10 meters long. Or suppose you install beacons in a cafe or pub, like Downtown and Tab do, to simplify ordering and payments. Aber ist es möglich, detailliertere Ergebnisse zu erhalten? Sagen, bis auf einige Zoll? Nach fast zwei Jahren in der Beacon-Markt, haben wir diese Fragen tausendmal gehört. Die Antwort ist wieder ja, aber bevor wir ins Detail gehen, sollten wir etwas, das von entscheidender Bedeutung ist anzugeben, aber oft vergessen. In neun von zehn, Sie nichts über Näherungszonen brauchen Ort zu verfolgen. Wenn Ihre Anwendung ist etwa die Bereitstellung relevanter Angebote zu einem Gang in der Mall, es gibt keinen Grund, um die Position des Benutzers mit 50 Zentimetern Genauigkeit ermitteln, weil der Gang ist etwa 10 Meter lang. Oder nehmen Sie Baken in einem Café oder Kneipe zu installieren, wie Downtown und Tab zu tun, um die Bestellung und Zahlungsverkehr zu vereinfachen. With a beacon under each table, you don’t need to determine how far a client is from a beacon. Rather, you only have to check which of the beacons is the closest to the client (by the way, Core Location does that automatically) to know at which table he or she is sitting. This is something solved with a well-designed app, not smoothing out RSSI readings. Remember to always consider how your solution is adding value to the user experience through location context. We’ve covered creating great UX for beacon-based applications in a separate post, so feel invited to delve deeper into the subject. Mit einem Leuchtfeuer unter jeder Tabelle, brauchen Sie nicht, um zu bestimmen, wie weit ein Client von einem Leuchtfeuer. Vielmehr müssen Sie nur überprüfen, welche der Baken in der Nähe von den Kunden ist (übrigens, tut Core Location dass automatisch) zu wissen, an welchen Tisch er oder sie sitzt. Das ist etwas, mit einem gut gestalteten App gelöst, nicht glätten RSSI Lesungen. Denken Sie daran, immer überlegen, wie Sie Ihre Lösung wird einen Mehrwert für den Anwender durch Ortskontext. Wir haben überdachte Schaffung großer UX für Bake-basierten Anwendungen in einem separaten Beitrag, so fühlen sich eingeladen, tiefer in das Thema zu vertiefen. We’ve established that nine out of ten use cases are fine with proximity zones and reliable distance approximations. What about the other one, though? Our answer to that is Estimote Indoor Location SDK, a tool developed for those rare cases when you do need precise location tracking. It enables developers to map a location in just a few minutes, using only a set of Estimote Beacons and an iPhone. A map created this way can be embedded into apps and used to navigate users through a venue. Wir haben festgestellt, dass neun von zehn Anwendungsfälle sind in Ordnung mit Näherungszonen und zuverlässige Entfernung Annäherungen. Was ist mit dem anderen, obwohl? Unsere Antwort darauf ist Estimote Indoor Location SDK, eine für den seltenen Fällen entwickelt, wenn Sie genaue Standortverfolgung tun Werkzeug. Es ermöglicht Entwicklern, um eine Position in nur wenigen Minuten zu kartieren, nur mit einem Satz von Estimote Beacons und ein iPhone. Eine Karte auf diese Weise erstellt wurden, können in Anwendungen eingebettet und verwendet, um Benutzer über einen Ort zu navigieren. When we started building it, we were experimenting with a method called trilateration. Because an RSSI reading from a single beacon gives you information about proximity, but not from what direction the signal is coming, you need at least three fixed reference points to understand the orientation in space. In theory, if you know the location of three beacons and measure distance to each one, you can figure out exactly where you are. But in practice, this is still the radio set in a crowded a train station situation, although now we have a 3.1 sound system instead. Als wir begannen, Gebäude es, wir waren mit einer Methode namens Trilateration zu experimentieren. Da ein RSSI Lesung aus einem einzigen Leuchtturm gibt Ihnen Informationen über die Nähe, aber nicht, aus welcher Richtung das Signal kommt, müssen Sie mindestens drei Fixpunkte, um die Orientierung im Raum zu verstehen. In der Theorie, wenn man die Lage der drei Baken und messen Sie die Entfernung zu jedem wissen, können Sie herausfinden, wo Sie sind. Aber in der Praxis ist dies immer noch das Funkgerät in einem überfüllten einem Bahnhof Situation, wenn auch jetzt haben wir ein 3.1 Soundsystem statt. We’ve quickly learned that trilateration alone won’t do the trick. It’s good enough if you’re okay with average accuracy of about 5 meters, but that’s well below the bar we’ve set for ourselves. We’ve started adding more and more complex components, and now that the first version of Indoor Location is released, it takes advantage of particle filtering, sensor fusion and a whole lot of noise reduction algorithms. Thanks to that, we include predictive analysis and the tons of data in location assessment, which increases the accuracy dramatically. Wir haben schnell gelernt, dass Trilateration allein wird nicht den Trick. Es ist gut genug, wenn Sie in Ordnung mit durchschnittlichen Genauigkeit von etwa 5 Meter sind, aber das ist weit unter der Bar die wir uns gesetzt haben. Wir haben das Hinzufügen von mehr und mehr komplexen Komponenten begonnen, und nun, da die erste Version von Indoor Location freigegeben wird, dauert es Vorteil der Partikelfilterung, Sensorfusion und einer ganzen Menge von Rauschunterdrückung Algorithmen. Dank dessen sind wir prädiktive Analyse und die Tonnen von Daten in Standortbewertung, was die Genauigkeit erhöht drastisch. Estimote Indoor Location SDK is still in an early phase of development, but already yields results on par with much more costly and time-consuming solutions. Our goal is to achieve stable location tracking with best accuracy possible, and we’re confident that we’ll reach that point in 2015. Fine tuning this technology will require tons of testing and experimenting, and we’re already in the process of doing it: our lab is also running every day to field-test what we hypothesize. In the next few weeks you can expect a software update giving you a taste of improved stability and better accuracy. We also want to take some of the noise reduction mechanisms we’ve developed for the purposes of Indoor Location and add them to our original beacon SDK, so that you non-Indoor apps can benefit from more accurate distance calculations too. 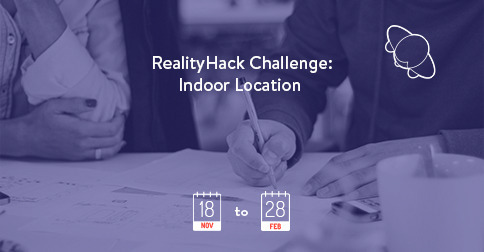 By the way, we currently have a RealityHack Challenge app contest running for best projects utilizing Estimote Indoor Location SDK. Why not take part? Estimote Indoor Location SDK ist noch in einer frühen Entwicklungsphase, aber schon liefert Ergebnisse auf einer Stufe mit sehr viel teurer und zeitraubende Lösungen. Unser Ziel ist es, eine stabile Lage tracking with beste Genauigkeit zu erreichen, und wir sind zuversichtlich, dass wir diesen Punkt im Jahr 2015. Die Feinabstimmung wird diese Technologie Tonnen Testen und Experimentieren erfordern zu erreichen, und wir sind bereits dabei, dies zu tun es: unser Labor wird auch jeden Tag laufen, um das, was wir die Hypothese-Testfeld. In den nächsten Wochen werden Sie ein Software-Update geben Ihnen einen Vorgeschmack auf eine verbesserte Stabilität und eine höhere Genauigkeit erwarten. Wir wollen auch einige der Rauschunterdrückung Mechanismen, die wir für die Zwecke der Indoor Location entwickelt haben, zu nehmen und fügen Sie sie zu unserer ursprünglichen Leuchtfeuer SDK, so dass Sie nicht-Indoor-Anwendungen können aus genauere Entfernungsberechnungen zu profitieren. By the way, haben wir derzeit eine RealityHack Challenge-App Contest läuft für die besten Projekte nutzen Estimote Indoor Location SDK. Warum teilnehmen? We hope you’ll find this information useful in your journey with Estimote Beacons and iBeacon technology. We’re sure it will be a long and exciting one, so if you want to ask about something, leave us your feedback or get more clarification on a given subject, don’t hesitate: drop our community managers a line at contact@estimote.com or tweet to us. Wojtek Borowicz, Community Evangelist at Estimote. Wir hoffen, dass Sie diese Informationen nützlich für Ihre Reise mit Estimote Beacons und IBeacon Technologie zu finden. Wir sind sicher, es wird ein langer und spannend zu werden, so dass, wenn Sie etwas fragen möchten, lassen Sie uns Ihr Feedback oder weitere Klarstellung zu einem bestimmten Thema, zögern Sie nicht: Drop unseren Community-Manager eine Linie an contact @ estimote .com oder twittern Sie uns. Wojtek Borowicz, Gemeinschafts Evangelist bei Estimote.